Overfishing is one of the biggest threats to the health of our oceans. 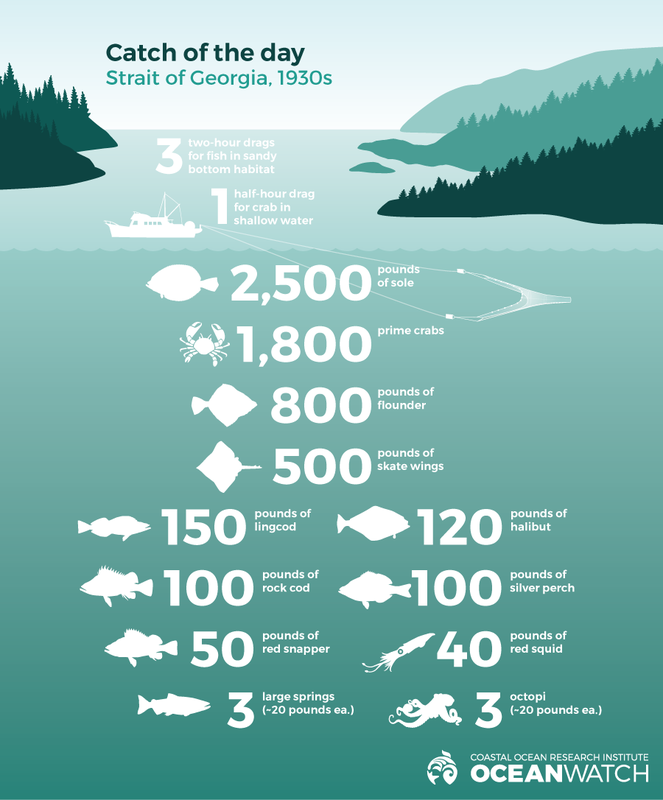 As awareness of the need for sustainable fishing practices grows, Howe Sound has emerged as home to one of the “darlings” of the sustainable seafood movement. Spot prawns have risen in popularity over the last five years, with commercial catches reaching a peak in 2011, indicating healthy populations and bringing huge economic benefits from the area. Yet while trap-caught spot prawns are certified sustainable seafood by the Vancouver Aquarium Marine Science Centre’s Ocean Wise program, there is room to improve. Concerns have arisen that some boats’ traps are damaging fragile sponge reefs. A bottom-trawl prawn and shrimp fishery is also active in the Sound, creating impacts on the sea floor, while risk of bycatch and entanglement of other marine life persists in fishing activities. Sport fishing is another industry on the rise in Howe Sound. Recreational fishing has always been common among residents of the area, but recent years have seen a huge spike in sport fishing tourism. Managed well, sport fishing can be an important way to foster sense of place and connection with nature and bring economic activity to the Sound. However, it also places additional pressure on vulnerable fish stocks and increases risk of overfishing due to unsustainable practices from inexperienced anglers and guides. As related by Norman Safarik in his book “Bluebacks and Silver Brights: A Lifetime in the B.C. Fisheries from Bounty to Plunder”, one day’s catch of a 40 to 48 foot trawler in the early 1930s near Vancouver in the “Gulf of Georgia” (southwest of Point Grey) was significant. According to this memoir, the day’s fishing included three drags, two hours each, of a bottom trawl net in sandy bottom habitat, and one half-hour drag in shallower water targeting crabs. Ratings are meant to provide the reader with a visual snapshot summary about the subject. Subject ratings were assigned by the Coastal Ocean Research Institute based on application of the criteria to the information in each article. 1) The status is healthy according to available data, 2) the trend is positive if known, 3) some data are available, and/or 4) actions to address or mitigate are well underway and are known to be effective. Actions should be taken to maintain positive status and/or trend. Status, trend, data, and/or actions provide contradictory or inconclusive information. Actions are needed to move into positive status and trend and avoid negative status and trend. 1) Impacts or issues are high risk or have resulted in a low or vulnerable status, 2) improvements are uncertain, minor, or slow, and/or 3) actions to address or mitigate are non-existent, vague, or have low effectiveness. Actions are needed to move into positive status and trend. Not rated due to the nature of the article, or there are not enough data to produce an assessment. Sport fishing is a huge economic generator for Howe Sound, with interest peaking in the wake of recent record salmon runs. But the growing interest in angling is adding to the pressure on vulnerable fish stocks and underscoring the need for more effective management, monitoring, training and education of visitors to Howe Sound. Celebrated as sustainable seafood, Howe Sound’s spot prawns and shrimp fisheries continue to be one of the most economically valuable fisheries in the region. Steps are being taken to further reduce the industry’s impact on the ecosystem by reducing bycatch and limiting fishing in sensitive areas, such as glass sponge reefs.